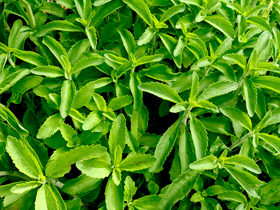 Stevia with its extracts having up to 300 times the sweetness of sugar, stevia has garnered attention with the rise in demand for low-carbohydrate, low-sugar food alternatives. Medical research has also shown possible benefits of stevia in treating obesity and high blood pressure. Because stevia has a negligible effect on blood glucose, it is attractive as a natural sweetener to people on carbohydrate-controlled diets. Single plant yields up to a 250 gram of dried leaf. Best grown in a well drained soil in full sun. The stevia herb will usually react well to growing outside in the summertime, but once winter approaches, it's best to keep the plant indoors at room temperature. Sow seeds indoors in February-May and be sure to expose the plant to a light and seal in a polythene bag or cover with a piece of glass until germination at 18-20C.